Preheat oven to 425°F (220°C). Melt half of the butter in small saucepan; toss with shredded hash browns. Press firmly into bottom and up side of 9-inch (23 cm) pie plate. Bake for 20 to 25 minutes or until starting to crisp. Reduce temperature to 350°F (180°C). Heat remaining butter in skillet set over medium-high heat. Sauté onion and garlic for 3 to 5 minutes or until softened. Add ham, asparagus and apple; cook for 3 to 5 minutes or until asparagus begins to soften. 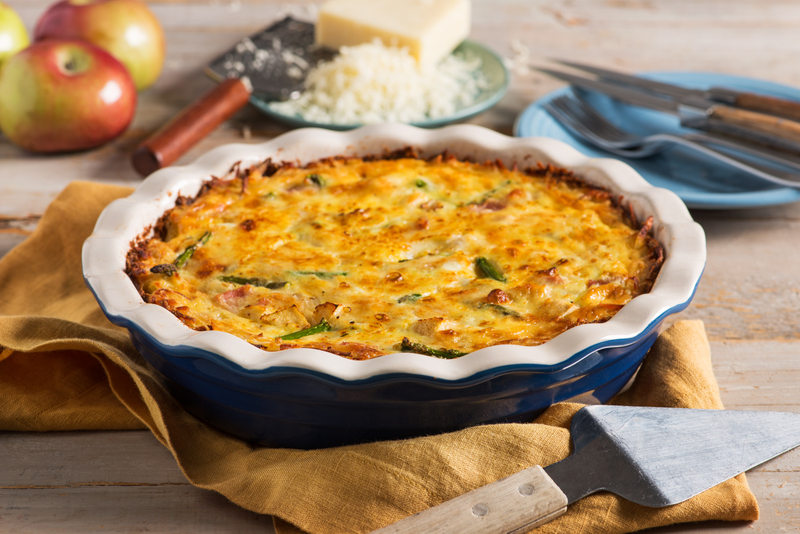 Scatter onion, garlic, ham, asparagus and apple over bottom of potato crust. Whisk together eggs, milk, Gruyère, Parmesan, mustard, salt and pepper. Pour into pie plate. 1. If you prefer to use fresh potatoes, boil or bake them (or use leftover baked potatoes). Let cool. Peel and shred coarsely. Add ½ tsp (2 mL) salt to mixture along with melted butter and proceed as per recipe. 2. Use red apples, such as McIntosh or Royal Gala.